Analog Devices EVAL-ADF4371 Evaluation Kit presents a demonstration and evaluation platform for the ADF4371 Microwave Wideband Synthesizer with integrated voltage controlled oscillator (VCO). The board provides a pre-mounted ADF4371 RF IC, a USB interface, power supply connectors, and 12 Subminiature Version A (SMA) connectors. 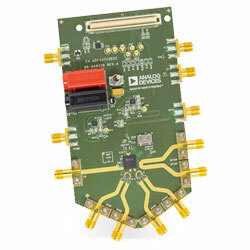 The Kit requires the SDP-S Controller Board (EVAL-SDP-CS1Z), which is not supplied with the kit. The controller board is based on a USB to Serial Engine providing connectivity to a PC via a USB 2.0 high-speed port. The board allows software programming of the EVADF4371 device.